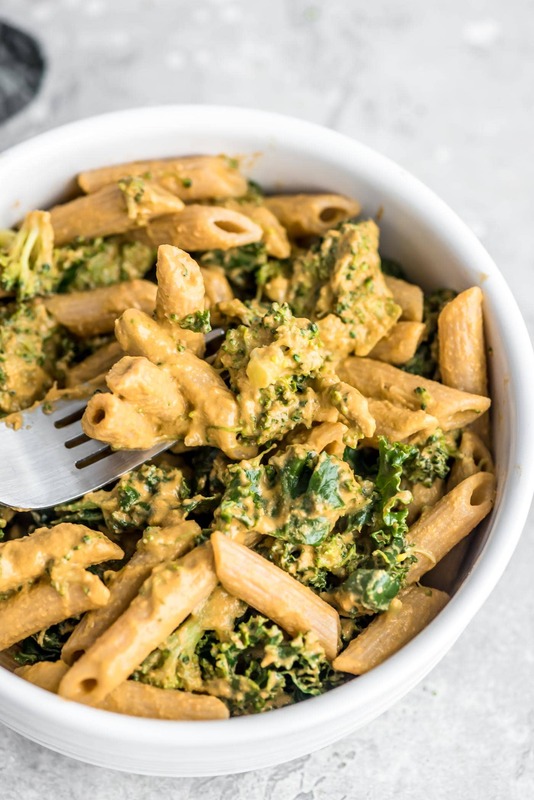 Try this roasted red pepper pesto pasta with kale for a filing, hearty plant-based meal that’s easy to make in less than 30 minutes. Kale is probably my favorite dark leafy green. It’s so rich in disease-preventing nutrients it is an excellent to include in your diet on a regular basis. Kale is a good source of fiber, which helps to manage blood sugar, helps you feel full and is great for a healthy digestive system and it’s rich in vitamin A, C and K as well as folate, a B vitamin linked to brain development. It’s also a good source of essential minerals such as potassium, calcium, zinc and phosphorus. 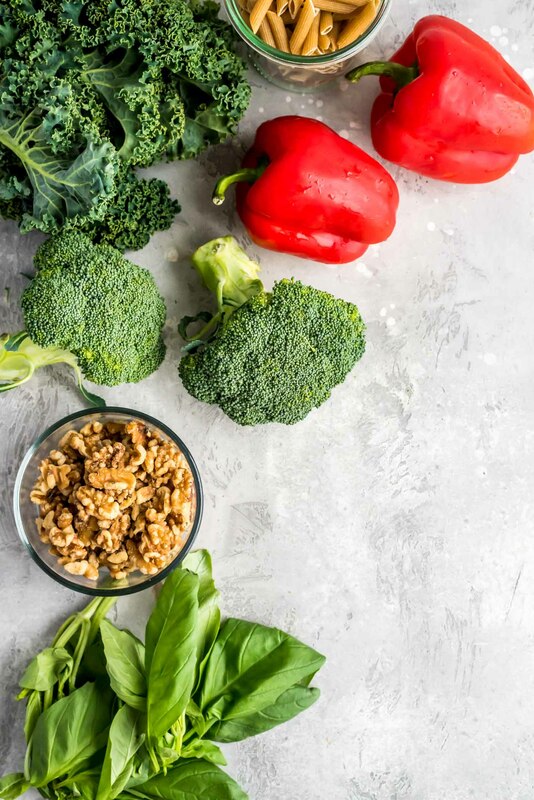 Kale also contains two phytonutrients, lutein and zeaxanthin that help keep our eyes healthy by protecting against age-related macular degeneration. 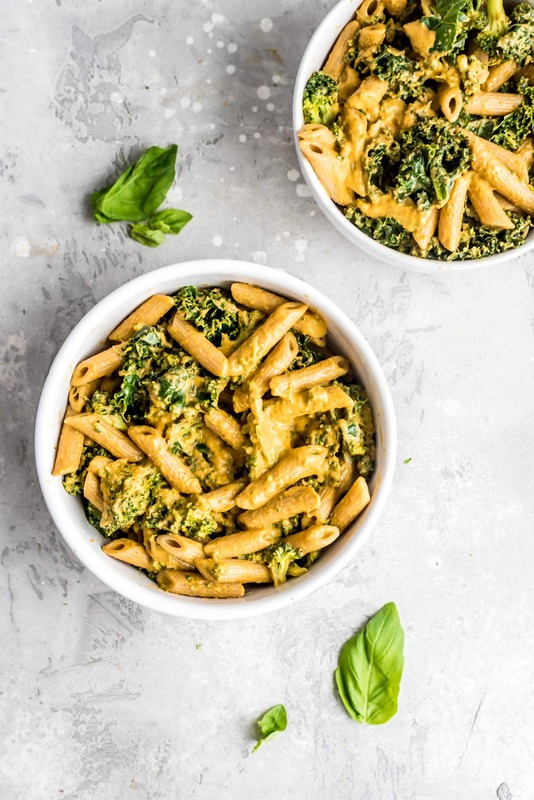 Red peppers are rich in free-radical fighting vitamin C, a powerful antioxidant that also helps increase our absorption of iron, which is great because the whole wheat pasta and optional nutritional yeast both contain iron. Bell peppers are also a good source of vitamin E, another antioxidant that’s especially good or a healthy immune system and they contain vitamin B6 and folate, which help proven anemia and vitamin A, which is important for healthy eyes and regenerating cells and tissues. Plus, in addition to the vitamin C, they’re also a source vitamin A and lycopene and these 3 together make red peppers a great disease-fighting veggie. Herbs tend to get overlooked as healthy additions to our diet when in fact, they’re some of the most nutrient-rich foods out there. Basil, in particular, is known to have antioxidant properties that can protect the body from aging, skin conditions and even some types of cancer. It’s also high in magnesium, vitamin K, iron, has antibacterial properties and has been shown to detoxify the liver. I used walnuts in the pesto instead of pine nuts but you could also do cashews, sunflower seeds or almonds. Walnuts are a good source of essential omega-3 fatty acids and also contain protein, fiber and antioxidants. 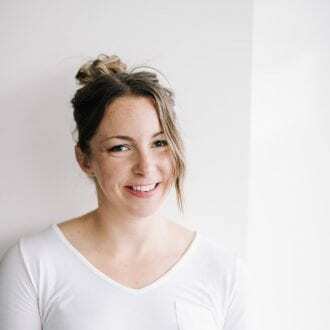 You can read about the importance of healthy fats in this post. I like nutritional yeast as a source of B12 and protein in my diet. You can read more about exactly what it is and how to use it in this post. Pre-heat oven to broil (500 F). Slice the red peppers in half, de-seed and smash down on the baking tray so they lay flat with the skin facing up. Roast in the oven for approximately 10 minutes until the skins start to blacken. Once the skins are blackened and bubbling, remove from the oven, cover with a dishcloth and let cool until you can hand them. When they’re cool enough to handle, peel the skins off. They’re now ready to use in recipes or store in the fridge. Olive oil is an ingredient in traditional pesto and one of the reasons why pesto is so high in fat. I don’t use much oil in my kitchen these days so I made this pesto recipe is oil-free. There are a few options for replacing oil in pesto recipes. First of all, you don’t really need olive oil in this recipe because the red peppers are moist enough to account for the missing liquid. Secondly, if you do need to thin it out a bit, water or vegetable broth does the trick just fine. That being said, my original version of this recipe was made with 1/4 cup olive oil instead of water. If you’re looking for a richer, higher-fat, more traditional pesto, feel free to use oil. As for the pine nuts found in traditional pesto, this recipe works well with cashews, almonds or walnuts. Pine nuts are expensive and not a nut I usually have on hand. I listed walnuts in the recipes but cashews, almonds or even sunflower seeds work for a variation. This meal is very simple to make so it’s a great weeknight option. You only need a few ingredients and it’s ready in less than 30 minutes. Plus red peppers, basil, almonds, kale and garlic all pack a ton of nutritional benefits. If you top it with nutritional yeast like I did you’ll get an extra hit of protein and B vitamins which if you’re plant-based like me, you can always use. Instead of plain nutritional yeast, you could also make vegan parmesan for an extra tasty topping. To save time, make the kale.broccoli and pasta and prepare the pesto ingredients while the red peppers are roasting. When the peppers are done, just peel and add to the rest of the pesto ingredients in the blender and that’s it! It seems like there is a lot to do but if you’re efficient with your time, it comes together very quickly. 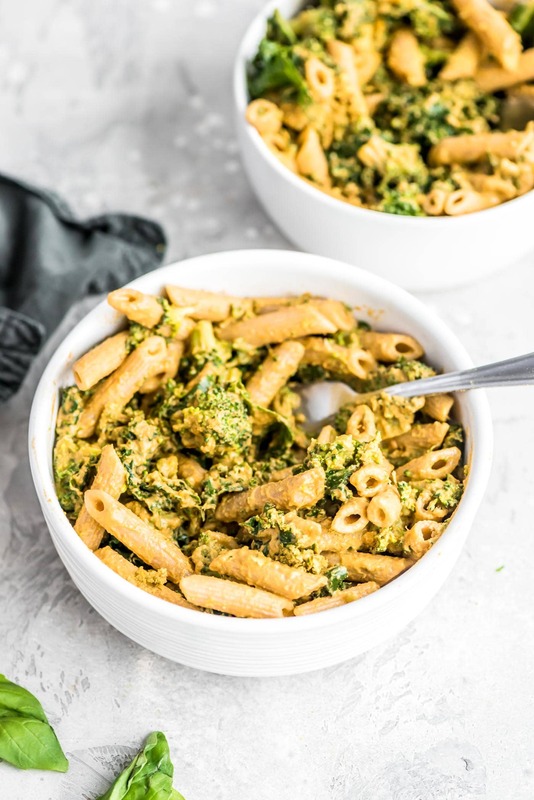 You can use this pesto sauce any way you like, try it as a dip for raw veggies, spread in a wrap or in your own pasta creations. 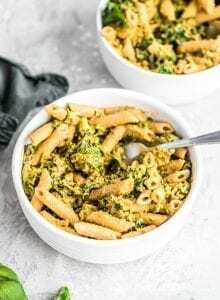 Try it over a bowl of whole-wheat pasta with kale and broccoli for a simple, healthy and easy vegan dinner. 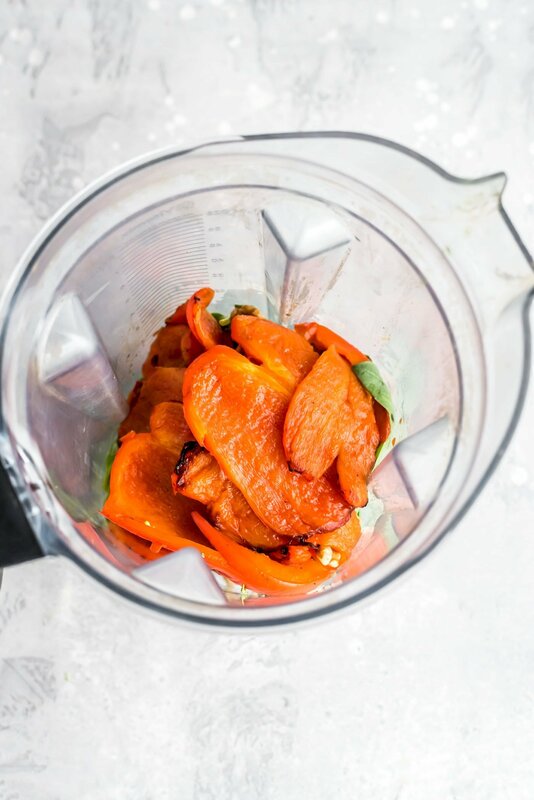 Add the roasted red peppers, garlic, basil, walnuts, water (or broth) sea salt and black pepper to a food processor or blender and pulse to combine. I would recommend leaving it a little on the chunkier side rather than blending to completely smooth. Cook the pasta according to instructions on package making sure to use a pot large enough that you’ll be able to add the veggies in. 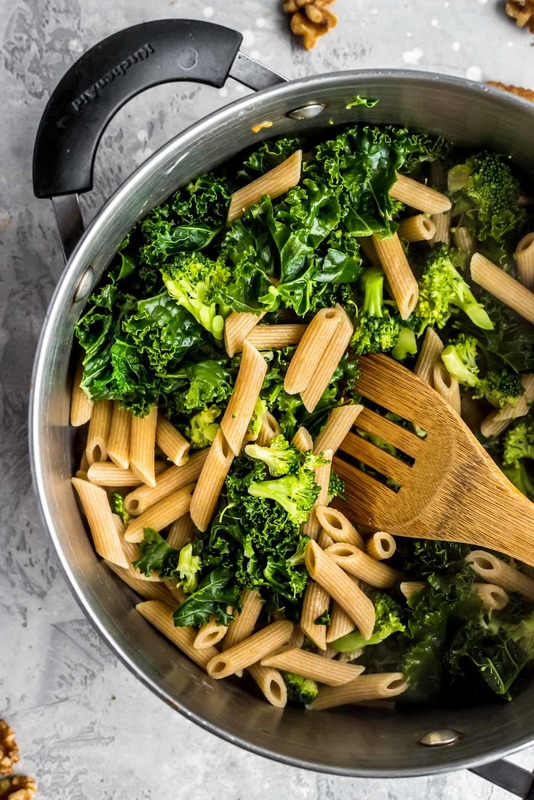 When there is about 5 minutes left on the pasta, add the kale and broccoli to the pot with the pasta. Drain the pasta and veggies then add them back to the pot. Add the red pepper pesto and mix well. Serve topped with fresh basil, fresh cracked black pepper and nutritional yeast or vegan parmesan. Ohhhh, I’m so glad that I found your blog! I’m here because Adria nominated you for the Liebster and had to check it out! LOVE your red pepper hummus and that pudding looks insane! I’m an on-again off-again runner. I run for events. But mostly I teach fitness classes, so it’s hard for me to fit in everything I love! I wanted to invite you to our weekly Raw Foods Thursdays. Looks like you have lots of wonderful raw recipes to share. You could start with these two winners tomorrow! Hope you stop by! I absolutely love roasted red peppers. They are by far one of my most favorite ingredients. They just add so much depth and flavor to whatever they are added to. Delicious looking meal here! Aren’t they delicious. Exactly what you said, depth and flavour 🙂 Mmmmmmm, I can’t wait to eat the leftovers!